We were delighted to share our concert on Friday evening, 12th April 2019 at Alfrick Church, with Claire Jaggers and her Animato Children's Choir. This was an important concert because it was Animato's first appearance in public! We were all amazed that this group of around 15 young singers entertained us for half an hour at the start of the concert with lively music, sung completely from memory, with no words or music in sight. Very inspiring! 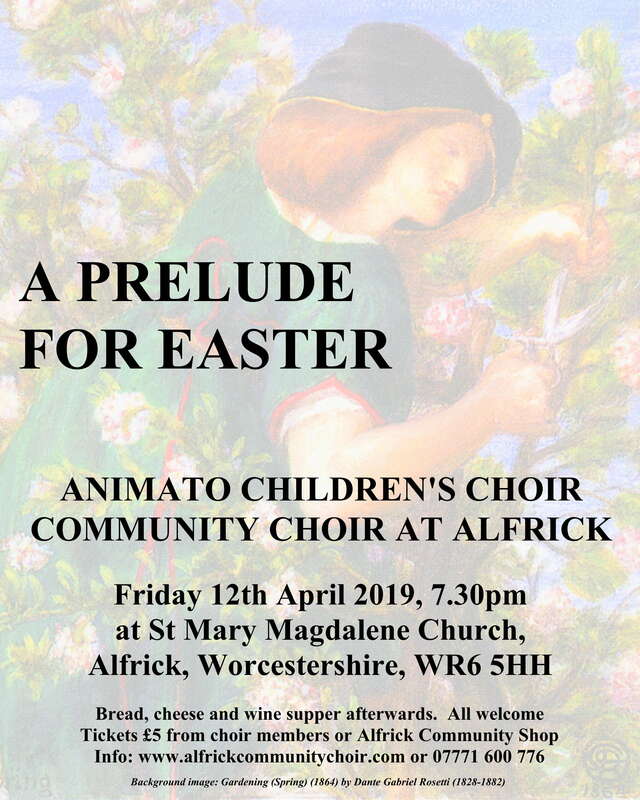 Following Animato came thirty minutes of reflective words and music from the Community Choir at Alfrick, including The Community Choir's contribution included the first performance of Schubert's song The Trout, arranged for mixed choir, with an extra fourth verse which Schubert never set. Our three groups of songs were prefaced by spoken introductions, read by Jean Colley, Ina Steele and Alan Matthews. Listen to a computer realisation of one of the new pieces the Community Choir performed here. Finally we all enjoyed a bread, cheese and wine supper.